Woohoo! I'm not a gluten-freebie myself, but I have a lot of special friends and yoga students who are. As a vegan, I know how it feels to go to a party and see a big platter of baked treats - none of which are vegan. (spoiler alert: it feels bad!) So, I don't want my gf pals to ever feel left out. Over the years, I've done quite a bit of adventuring with vegan & gluten-free baking. I've had pretty good luck with gf cookies (lots of great recipes from Alyson Kramer! ), but just so-so luck with cakes. 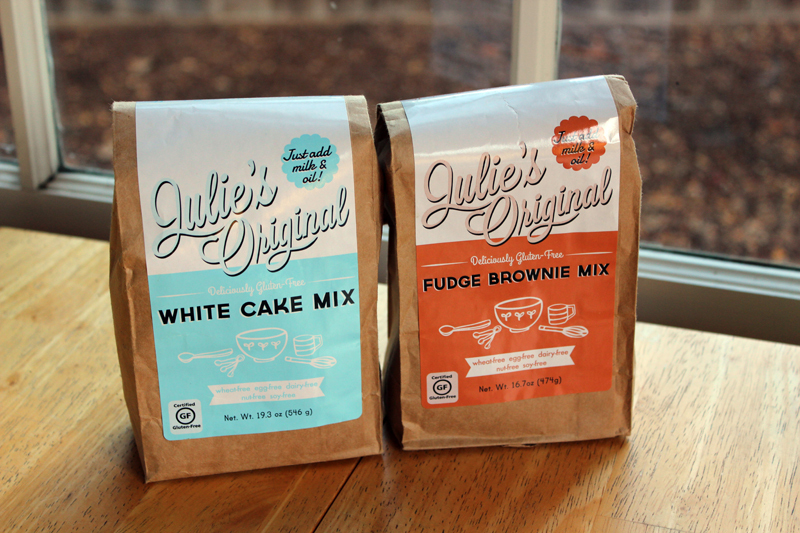 When my pal Julie Hasson started a new line of gluten-free and vegan baking mixes called Julie's Original, I knew they'd be good! How did I know? Well, I have a bunch of Julie's cookbooks (Vegan Diner, Vegan Pizza, Vegan Casseroles, and more) ~ AND I've eaten at the food cart that Julie and her husband Jay used to run in Portland, OR. All very good! So, for me, Julie is a trusted source indeed. Before she was a vegan, Julie was a professional baker. Upon becoming vegan, she learned all sorts of tricks and created great vegan recipes. Then, when her health required a switch to a gluten-free diet... she dove in and created Julie's Original. Truth be told, I bought these mixes a while ago, but I've been waiting for a gluten-free pal to share them with. I know gluten-free folks don't have their friends volunteer to bake for them very often! It's been so long since I bought these packs, that in the meantime Julie has updated her packaging. Now the mixes come in boxes, and they look even cuter. puffy! golden! 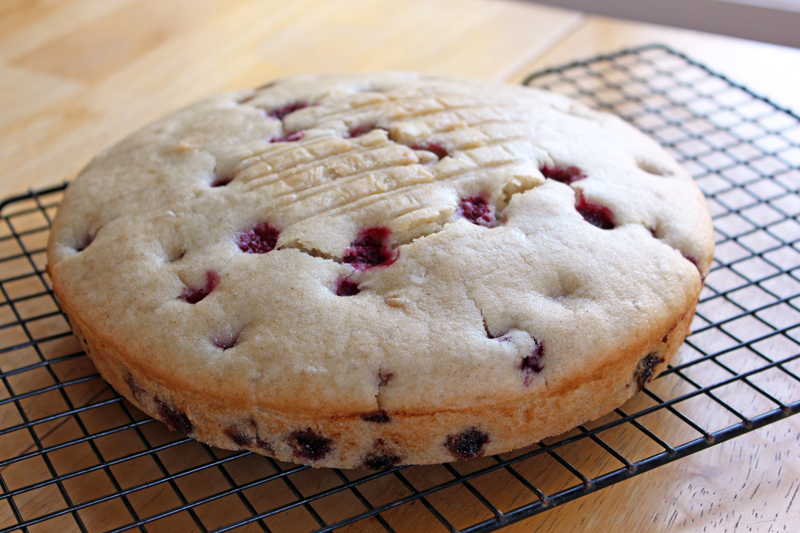 studded with raspberries! delicious! Finally I had a chance to use my baking mix when my gluten-free and vegan cousin was in town, and we had a big family party planned (a birthday party!). The baking mixes come in two flavors: chocolate fudge brownie and white cake mix. But, here's the cool thing: on her website, Julie has all sorts of creative recipes to enhance the mixes in loads of creative ways. 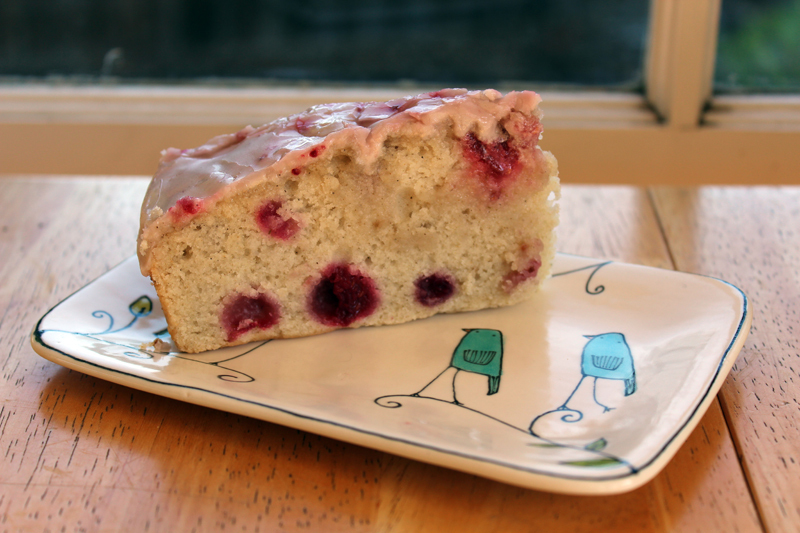 On the night before our family gathering, I was trying to decided between Almond-Raspberry Cake, Pumpkin Spice Coffee Cake, Chai Carrot Zucchini Cake, or Lemon-Raspberry. So many tempting directions you can go with one box of cake mix! 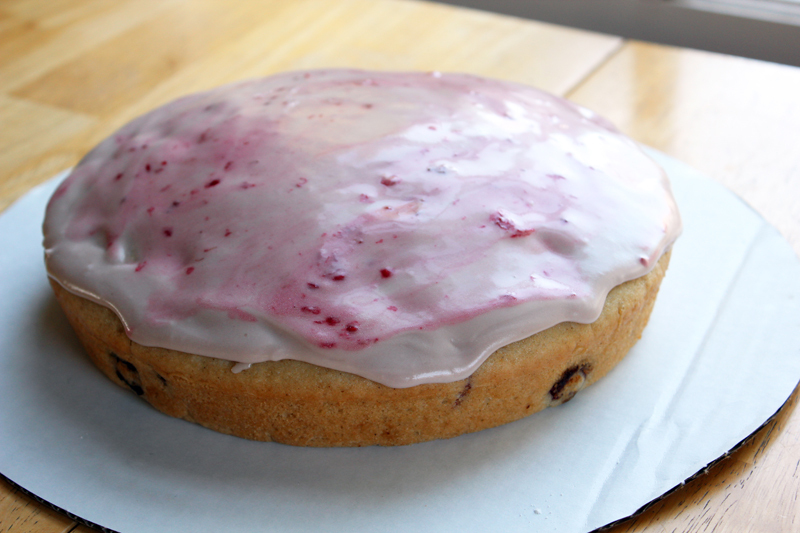 I finally settled on the Almond-Raspberry variation, and the cake turned out amazing! My cousin also made a non-gluten-free chocolate cake, so we had two little birthday cakes, for a crowd of 11-12 people. 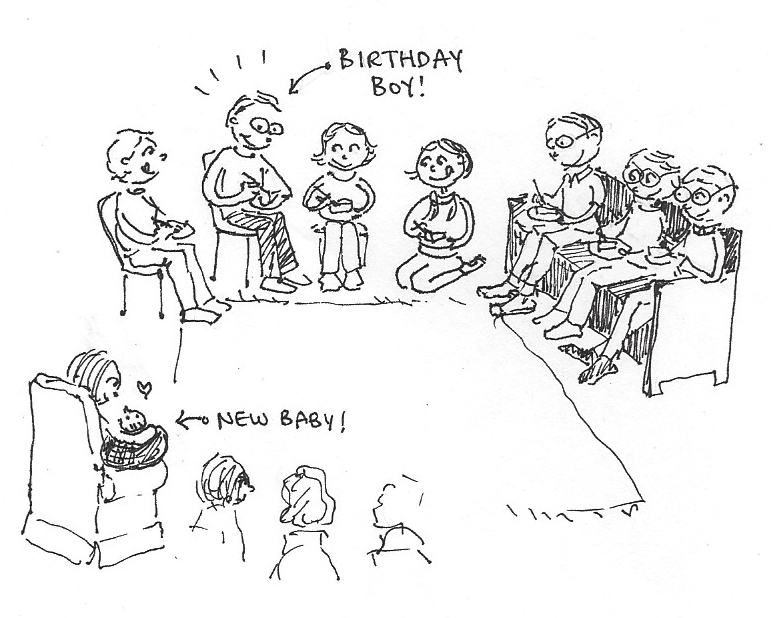 Everyone had one small slice of each cake - and in a room full of gluten-eaters, there was not one piece of uneaten cake left on anyone's plate. That's quite an endorsement! a leftover slice the next day... fresh out of the freezer, and just minutes before falling prey to my hungry tummy. This poor slice is a bit banged up, but I wanted you to see how nice the cake looked inside! I have to say, I was really, really impressed with this cake mix, and I will probably never again bother with trying to make a gluten free cake from scratch. I totally appreciated the ease, the sense of "this-won't-fail" confidence, and - most of all - the fantastic results of this cake! The flavor was fantastic - vanilla-y, with just the right amount of sweetness (not at all overdone). And the texture was also great. Honestly, texture has been the biggest struggle for me with baking gf cakes. I've often started with a trip to the natural foods store, buying 5 different kinds of flours and starches - only to be uncertain if the recipe will even work out -- and then ended with cakes that were gritty, or gummy, or that were gritty in some parts and weirdly gummy in other parts of the cake. Blech. Meanwhile, Julie's cake mix resulted in a great texture that was totally consistent throughout, light, and not crumbly. I plan on keeping a box of this in my pantry, so that anytime I want to make something special for a gf pal, I'll have a reliable and tasty plan of action at the ready! I still have my packet of the chocolate brownie mix left over. I guess I'm gonna have to invite a gf pal over for dinner pronto, so that I have a good excuse to try that one out! Since Julie is a pal of mine, I really wanted to like these mixes. Happily, I did! I will definitely buy it again, and I actually plan on buying some boxes for Christmas presents for some of my gf loved ones. Highly recommended! You are so thoughtful to make sure that your GF friends have cake too. Like you, I've definitely been to events where there was nothing vegan at all or only chips and salsa. When people go out of their way to make something vegan, it's really touching. I'm sure your friends were delighted. I'm not surprised that Julie's cake mix turned out so well. Like you, I'm a big fan of her work, and her recipes are consistently fabulous. What a wonderful resource to have access to consistently good GF cakes and brownies. It seems as if making GF desserts from scratch often involves trial and error, and so it's nice to have the easy option of a boxed/bagged option that will work and be delicious! I haven't tried Julie's mixes, but I'm sure they're delicious!! Julie is the best!! And that cake looks insanely delicious. The texture of the cake looks great! I, too, have been disappointed by grainy gluten free baking mix recipes -- I will have to try those mixes. And luckily it looks like the Republic of V (in my neighborhood) carries her mixes. Hooray! 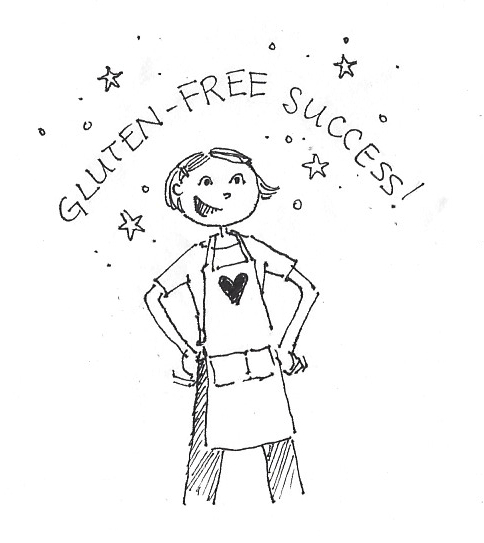 yay for gluten free success! the cake looks AWESOME! Oh yay, I'm so glad these are great. I'll have to pick up a couple for one of my fave g/f people whilst I'm over there for VVC. I love that you went for the Almond Raspberry variation, it's totally what I'd have picked too. I am not gluten free either, but I really feel for anyone with special food needs. I've made some gf treats for gf friends and family and it's so much better to have something that you know I going to work! I wonder if these mixes are available near me. I wanted to bring some of these back with me when I was in the US last year, but I was worried the bags would burst in my luggage (and the tupperware containers I always travel with were already full of Tings and marshmallows, you know how it is). Hopefully next year I can bring one back. It looks great. So lovely for you to make sure your gf friends have food. I am not gf either, but I always want to make sure that my gf buddies (or gf bake sale attendees) have something good to eat.